Hi friends! I hope you're having a good day! We are doing pretty good. This is my first day all week when I haven't been non stop go. It's kind of nice. I had a visit with a friend this morning and then in the afternoon we'll have a birthday party to attend. Here's a fall card I made forever ago. I think all the elements are October Afternoon? I'm pretty sure the washi tape is from Pebbles. Can I just say that I'm giving thanks for the fall(ish) weather right now? The air conditioning in our van isn't working and let me tell you, the slight breeze and the fact that it cools down earlier in the day is AMAZING! I hope you're all well! Have a great day! 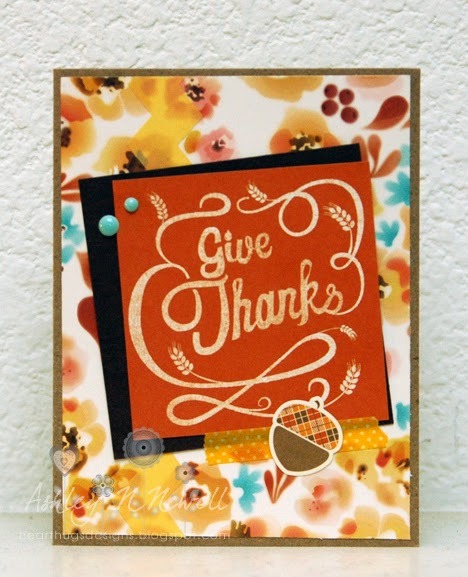 Yay for fall inspired cards! Yours is absolutely lovely! That background paper is gorgeous, so fall, I love this!